Regardless of how you spend your time and the role(s) you fill, at some point or another meetings will crop up. And nine times out of ten, they're the kind that leave you wondering how smart is too smart, and how casual is too casual. Cue the concept of a casual yet powerful outfit, and one that still enables you to express your femininity. I'm a huge fan of cute jackets that have the ability to totally transform an outfit; and never more so than when it comes to putting together smart outfits for super seeeerious occasions. Or y'know, just average meetings. I picked up this Topshop beauty earlier in the month and I'm still not over it. The neckline, colour and raw cut see to 'powerful' and the cropped design and ruffles lend themselves to 'femininity'. This blue version sold out really quickly, but I've linked the other five colours available below - so tempted by the gingham version! I think we've established by now my obsession with both sky-high heels and statement bags, but a recent introduction to Swedish brand Sudio has now added another item to the ticklist - headphones! The black and rose gold earphones I'm wearing in this post are the Vasa Bla; wireless earphones with studio quality sound and style for days. By pairing them up with your phone, you can take calls with the built-in microphone, control your phone with the remote, and listen to music to pump yourself up on your way to the meeting. The best part? 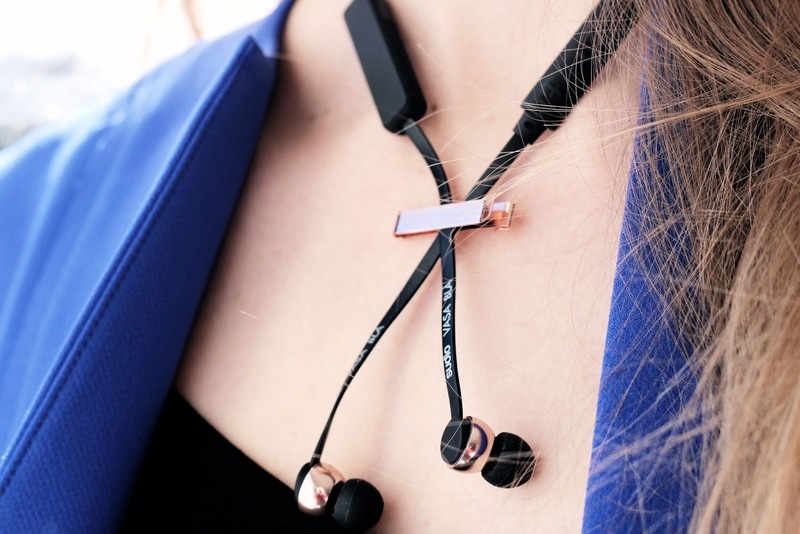 Once you've finished using them, you can use the rose gold clip to secure them around your neck - perfect! Psst! Use the code aglassofice15 for 15% off on their website. 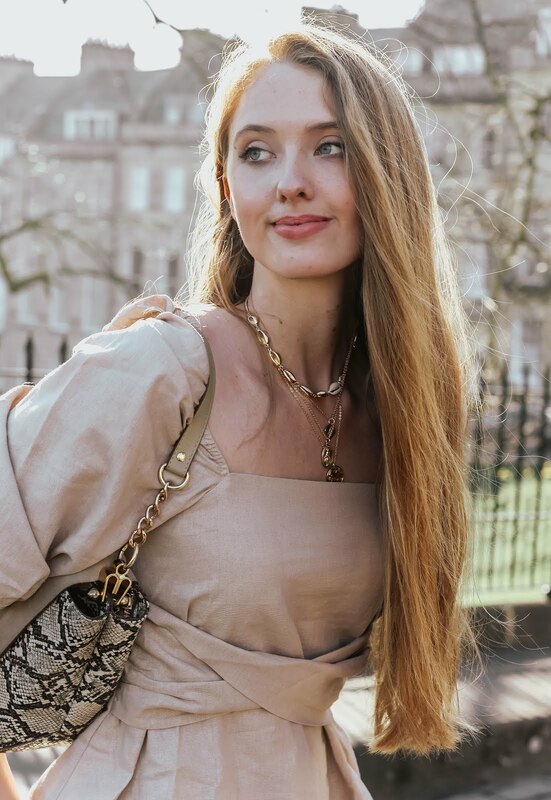 As Spring steps onto the scene, I tend to unintentionally look to jewellery in warmer tones, often swapping silver for gold and rose gold. 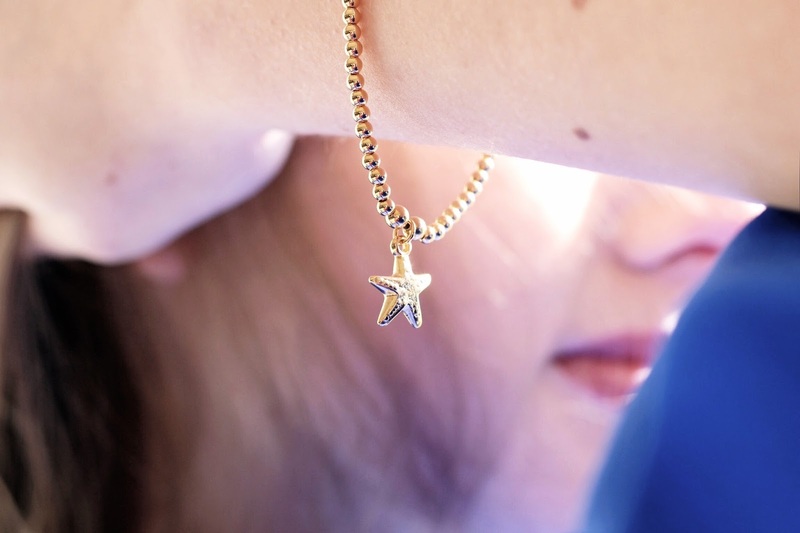 The starfish charm on this ChloBo bracelet has set my mind on summer and I adore how dainty the design is; perfect for adding a pretty yet entirely subtle touch to this smart outfit. The starfish charm symbolises friendship and happiness, which is just as well as you'll no doubt be seeing much more of this pretty piece on my blog over the coming months! I hope the styling in this post has been of some help; I'd love to hear your thoughts on powerful-but-feminine styling for meetings? On a different note, hope everyone has a lovely weekend - and Happy Mother's Day to the gorgeous mums reading this! Seeing your fashion posts always make me want to step up my style game haha I'm terrible at fashion! Loving the ruffled blue jacket, so perfect to spice up any look. I love a good jacket because it's such an easy way to take any look to the next level. You are definitely making a style statement in this Topshop beauty Gabrielle! 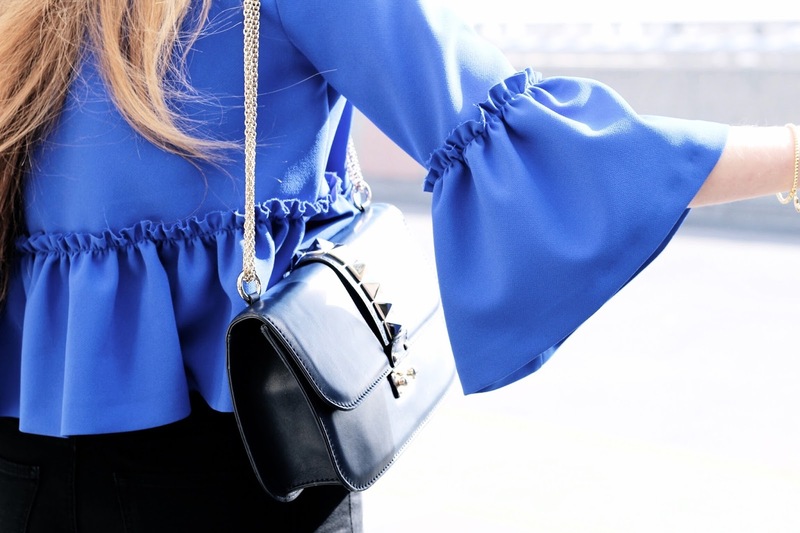 The vibrant blue hue, cropped ruffled sleeves and peplum details are all TTDF! You're right; the color of that jacket IS powerful, while the ruffles make is feminine and pretty. I recently saw someone dressed for work along a similar vein: she wore a silk scarf tied in a very large bow over a short jacket and slim-legged pants. I just love that combination of professional and feminine! Your bracelet is also very lovely, by the way. You really look stunning in blue! I love the jewelries and accessories that you added in your outfit. Especially the star pendant and the headphones. I tend to just use my original headphones because usually others are not as comfortable. I just love the design of your headphones though, so sleek and goes really well with your outfit! gorgeous outfit! blue is your color!! and that bracelet is perfect! This styling is very elegant and feminine....and at the same time there is that special something. That blue jacket is such a statement piece. It is like a crossover between a classical Chanel jacket and a playful blouse with ruffle sleeves...who wouldn't notice it? I absolutely love how you put this together and you get bonus points for looking so cheerful and confident while wearing it. Utterly beautiful look for sure!!!!!!!!!!! I am a fan of the cute jacket too! Also, love your bell sleeves, they are very pretty and suit you so well! The jacket is fabulous! Looks great on you and its colour goes so well with your hair and the jeans you're wearing. That jacket is AMAZING. As I type this, I'm trying hard to resist the urge to go onto the Topshop website and snap it in all available colours. I love the crop fit and those ruffle sleeves. The combination of powerful yet feminine is totally me! 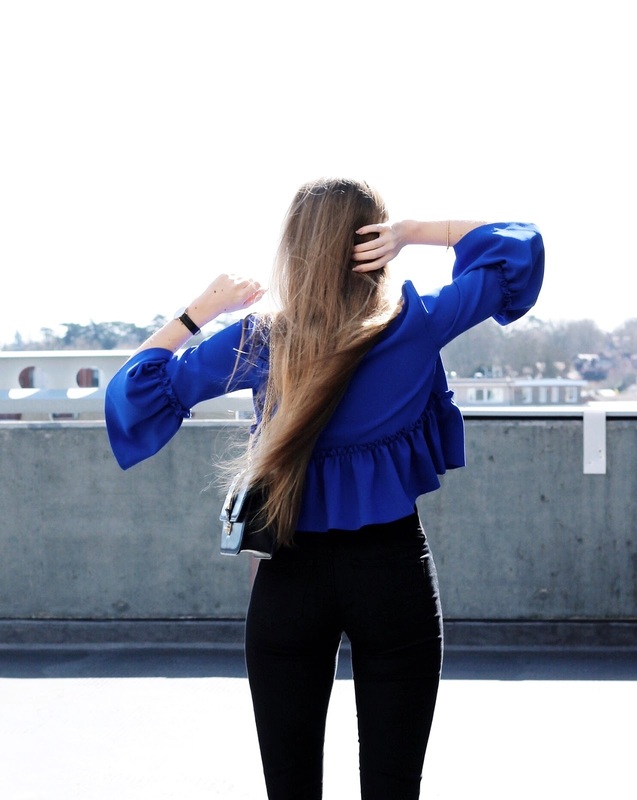 I am such a fan of ruffles and I love the way you have styled this entire outfit. What a gorgeous meeting look! I adore your beautiful jacket, it's so chic. I hope you're having a wonderful weekend! What a stunning jacket. And that blue tone looks beautiful on you! This jacket is gorgeous! And this royal blue colour is the best with your hair. This is indeed a great outfit for meetings, it can be difficult to know how to dress - you never know how formal the people in front of you will be. Block colours and simple, classic prints are my favourite to wear for such occasions. BABE YOU LOOK SO GORGEOUS!! You look so beautiful! That jacket is just unique.. Wow! Such a feminine vest ! I love the ruffles of this vest and this blue color. YES!! So feminine and powerful! 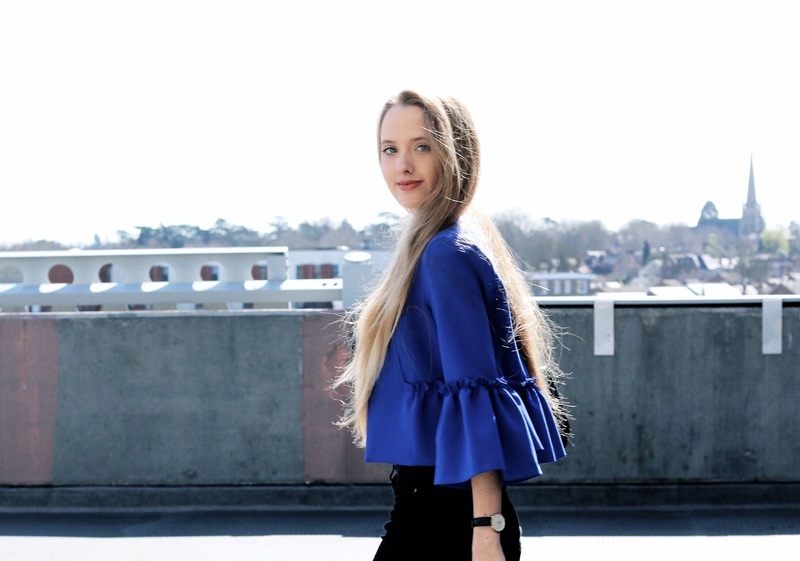 I love this blue jacket and sleeves! So chic as always Gabrielle! Love this pop of blue! You have legs for dayzzz!!!! What an awesome outfit for a meeting, I love the colours and ruffles too! Obsessed with your meeting styling! Ironically, I am wearing a black + royal blue combo to the office today :) You are so beautiful! What a gorgeous jacket! The colour is just perfect. This jacket is my favorite!! I also adore your bracelet! Oh gosh, so much I am obsessed with in this blog post! You've certainly nailed the meeting styling, I'll definitely be taking some tips as this is something I struggle with. But aside from that, I'm seriously eyeing up the Raw Frill Jacket - especially now I've seen just how many colours are available! omg I love your gorgeous blue top, darling Gab! This entire outfit is amazing! In love with your outfit, hun!!! You look so chic and stylish, that jacket is really amazing! Perfect look. I really like the rose gold tone and the headphones are really cool. Oh wow - you look absolutely gorgeous!! This is such a lovely post and the outfit is absolutely beautiful!! I love that feminine/powerful look and it's perfect for everyday too! As always you look absolutely gorgeous and so elegant! This jacket is so pretty, love the frills and the colour. I definitely find workwear challenging for me as I don't feel like myself in it, but you kind of have to do it if you work in an office. I love the bell sleeves on your jacket though! I'm so into them at the moment, and that jacket really is perfect for looking professional but still feeling pretty and fun. That is the cutest jacket Gabrielle! I love the style & sleeve design. Looks so pretty on you. Oooo I LOVE that jacket! Love how feminine that little jacket is but the heels really bring the power to this look in my opinion, they're really nice and I love that you could wear them with a hell of a lot of different outfits too. PS, is it bad that I thought those earphones made a really nice necklace from afar? I must admit, I really dislike the term "smart-casual", I mean what is that? ha! But I think your outfit would be very ice for a "smart casual" event. ha! Absoloutely loving the heels!